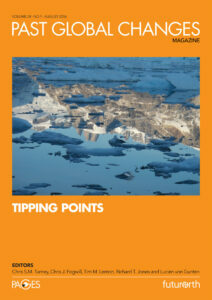 In the just published PAGES issue of Past Global Changes there is a science highlight on Tipping points or “Lessons from the Past for the Future” as the editorial suggests. In ten short 2-page contributions the most up-to-date ideas about past climatic transitions are highlighted together with examples from ecological and socio-ecological abrupt shifts. We have contributed in this issue a short piece on how the shift of the Sahara has been shaping our thinking about abrupt change. This entry was posted in latest news and tagged climate change, paper, Sahara, tipping point on August 19, 2016 by vdakos.